I, of course, am going to the rock climbing mecca, having discovered it last February and vowed I would return. It’s perfect for solo climbers who want to meet people to climb with and dunk themselves in the ocean whenever they get a little too warm. Kind of like the Camp 4 of Southeast Asia. I land in Tonsai and ask around about lodging, because this is a trick I’ve learned about Thailand: it’s best to look at lodging in person, and often the cheapest places are not anywhere online. I end up shouldering my little rolling bag and schlepping it into the jungle, pausing every so often at “resorts” to ask their price. There’s one with a pool for around $50, so I keep walking. Then there’s a bungalow for 400 baht, but I know things get cheaper so I keep going farther. On top of a little hill I find one for 200 baht, or less than $6. 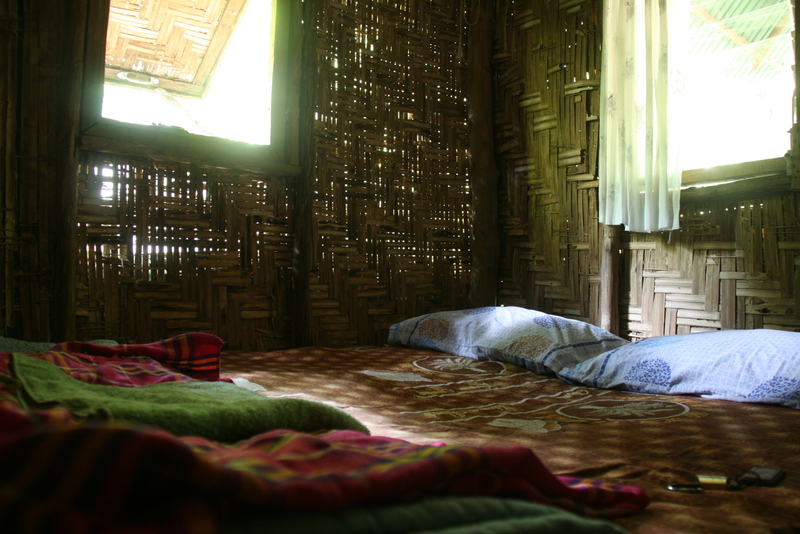 It’s a tiny hut constructed out of a concrete slab, sheet metal, rushes and sticks, and the electricity comes on from 6 pm to midnight, but the sheet covering the bed looks clean, at least apart from the sand around the edges. There’s pink netting hanging over the middle of the bed to catch the debris that falls from the ceiling, which reminds me of four-poster beds in the days of thatched roofs. I feel the bed — a bit saggy, but ok — and say I’ll take it. I take a cold shower and am quite happy to be alone in my little hut in the jungle. I do the only logical thing: take a nap. I wake up with more mosquito bites than I started out with, but I’ve planned for this, and smear my Thai mosquito ointment on the bites. Over the next few days I discover that my hut appears to be perpetually damp, despite my efforts to air the place out: the humidity, no doubt. Instead of drying, my bikini starts to smell like it’s molding. The weather is extra humid and raining intermittently. However, I tell myself it’s still more comfortable than camping. Fortunately, I have brought my own soap, wet wipes, toilet paper and headlamp: I was prepared for camping-level digs. I’d move to somewhere more expensive, but from what I can tell from the discussions at the outdoor bars, everywhere has its set of problems and even the fanciest place on the bay hasn’t found a way to get rid of the humidity. There’s apparently one place in the entire inlet that has semi-decent wifi, and it’s the bar, but you have to buy the wifi separately. I talk to one guy who’s staying on Ralay beach a ten-minute walk along a jungle path, where everything is more developed, and it sounds like he’s paying over triple what I am for something worse than I have.